I just read a great post from this blog on Minecraft and thought I would add my thoughts on the subject. Whenever you mention the word “video game” to a parent, it often brings quite a few negative connotations. Usually the negative words associated with this are: blood, shooting, waste of time, and mindless. As an adolescent, I remember trying to justify to my mother that hours of playing Nintendo’s Zelda were actually beneficial to me. I would say, “but it improves my hand eye coordination Mom!” She would often let out a sigh, roll her eyes and give me another 15 minutes to try and complete another level. At the time, improving hand eye coordination was really the only apparent benefit of playing video games at the apparent cost of so many. As part of my graduate research, I have recently been doing quite a bit of academic research on game-based learning. Typically, with any new type of technology, there is a bit of resistance and usually group of critics who often propagate myths without having done the research themselves. I have encountered similar resistance when we first started doing blogging in the classroom (how can blogging possibly improve academic skills? ), ipads and mobile devices (they are a distraction and waste of time) and now games. Fast forward 20 years and gaming is still a huge market. Video games have evolved into highly sophisticated multiplayer games and strategy-based games that require much more than trying to rapidly tap A, A, B, B, select, start, up, down as fast as you can. Sure, those games certainly exist but new genres have hit the market that require higher-order thinking skills, complex communication, collaboration and problem-solving. One of those genres, simulation games, is beginning to overlap with other fields such as medicine, military and education. So what are simulation-based games? Simulation games are virtual games that simulate a real-world experience that are often difficult or dangerous to take part in real life. Some of them are life-based simulation games such as the Sims and others are more construction and strategy based games such as Civilization, SimCity World of Warcraft, and Minecraft. Games (not just video games) have actually taken quite awhile to be taken seriously by educators. Games, by themselves, are obviously highly engaging, fun and motivating. However, these reasons alone are not enough to use them educationally. For example, Uno is a fun and engaging game but this alone doesn’t mean that it should be used in the classroom. There needs to be careful planning, goals, integration into the curriculum and reflection built into any type of technology or innovative practice. I have recently been using Minecraft in the classroom to help develop some important mathematical concepts as well as those higher-order thinkings skills. As a teacher and a bit of a gamer myself, I can clearly see the advantages of leveraging games for learning. Minecraft is a virtual 3D simulation game in which players need to look for resources to use to craft and build just about anything. There is a one player survival mode where it is just you alone in the world and there are monsters out there so you need to survive. There is also a creative mode feature where you have access to all resources in the game. There is also a multiplayer mode (my favorite) where you interact and collaborate with people in real-time. Creativity is absolutely endless and I have seen people build ancient pyramids, castles, and even whole cities! 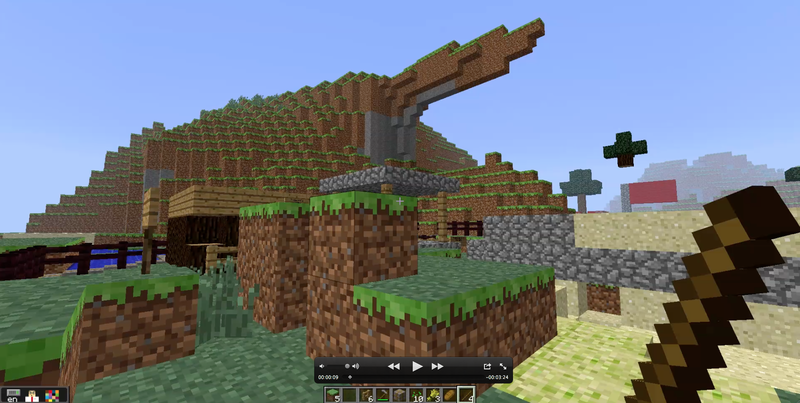 So how can you use Minecraft for learning? Economics/Math-Minecraft has plenty of multiplayer servers. Recently, I joined one and I am absolutely amazed at the kind of learning that happens on this. One server has an economy built into it so players receive money from selling their items. People also begin opening up shops selling and trading items. This opens up a real life (sort of) context where students could learn the idea of supply, demand, market prices and how economies are built. Science-I have been following a high school teacher in Australia who uses Minecraft to teach concepts in biology. For example, he has students construct 3D models of eukaryotic cells. He uses a multiplayer mod to explore how neurotransmitters work. ← Apple’s Education Announcement-What does it mean for educators? Yes, I love it for a variety of reasons. As long as educational goals are transparent (to teacher and student), then it can be a worthwhile activity. Do you know if anyone has written a decent mod that implements math into the Minecraft world? I’m interested in something more meaningful than a popup that makes the kid solve a math problem before continuing (which I’ve seen suggested in a forum). Rather, the ideal mod would have the kids use math without necessarily realizing that they were doing “school”. I haven’t heard of a specific math mod but had quite a bit of success by creating my own using Minecraftedu. I used it for probabilities, fractions and decimals. I created a plot of land into 10×10 grids and added flowers, grass, pumpkins, etc and had students tally them up using a spreadsheet and then use formulas to calculate the mean, median, mode, percentage, etc. They got the concepts through an authentic way! If you find anything, please let me know. I just wrote a mod that does exactly this. I wrote it for my kids but decided to release it as there seemed to be other parents that would be interested.